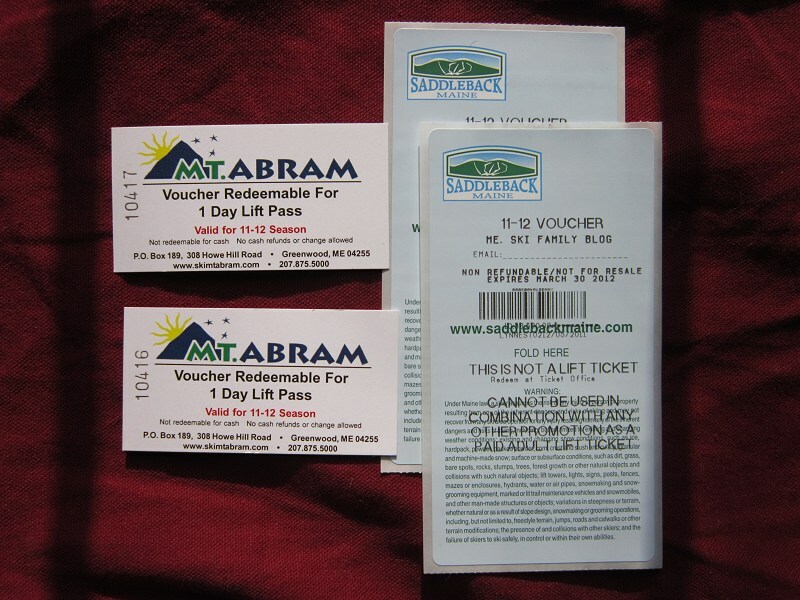 A Family Skiing in Maine: Lift Ticket Giveaway to Mt. Abram and Saddleback! Lift Ticket Giveaway to Mt. Abram and Saddleback! To celebrate the upcoming openings (weekend of December 17) at Saddleback and Mt. Abram, the fine folks at these two Maine ski areas have provided the A Family Skiing in Maine blog lift tickets to give away to our blog readers! 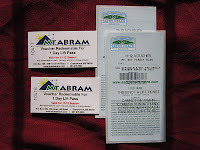 Both areas have provided two adult lift tickets good for any day of the 2011-12 ski season. We will be giving away these tickets to two lucky winners! Mt. Abram is a great ski mountain in Locke Mills, Maine. They have a very nice beginner learning area, superior intermediate to advanced terrain and a super family-friendly atmosphere. Check out my review of Mt. Abram here. Saddleback is another great ski mountain and is located near Rangeley Maine. They have the best learning area I have seen and has excellent intermediate to advanced terrain. The vibe is relaxed and smiles are plentiful especially when you have the best ski day ever. Check out my review of Saddleback and my definitive guide to all 66 trails at Saddleback. Both mountains offer a pure Maine skiing experience. I highly encourage you to visit them this winter! For the contest, there are multiple ways to enter the drawing. Do everything on the list and your name will be entered 7 times into the drawing! Many thanks to Saddleback and Mt. Abram for providing these lift tickets. The drawing will be held on Saturday, December 17th. GOOD LUCK AND THINK SNOW! I hope both SB & MtA get dumped on soon! The choices are so limited.... Why doesn't it allow my Twitter name??? Nice site Mike...appreciate the updates and video demos. Thanks! Thanks for this nice site, good work on it so far. As a pass holder at the Back the past 2 yrs I certainly share your passion for that special mtn. While I wasn;t able to get a pass there this yr due to new work comittments for my wife and I, we certainly hope to get up there a couple times. Very cool site! Great job! Hoping to bring the family skiing this winter! Thanks for the giveaway! I'm in! Mt. Abram is on my list of mountains to visit this year as part of my 60 day snowboarding trip, and I can't wait to check out this beautiful mountain! Can't argue the awesomeness of skiing Maine! Thanks. Lift ticket giveaway? That idea is amazing. I'd love to ski these two areas in Maine. Never skied there. Looking forward to coming up to Maine and taking the kids skiing for their second time! They loved the first time at Saddleback so much! Praying for lots of snow on the mountains! I am totally in love with Saddleback area! I love Saddleback. Has always been my favorite mountain in Maine to ski. I havn't actually been in 20 or so years, but I would love to go fall down for a day. I've never skied in maine and I've lived in new england for a couple years now! I've heard some really great things and can't wait to go sometime! PRAY FOR SNOWWWW!!!!! This is a great idea - and I'd love to win some free tickets too.